It has always been frustrating not being able to wield projectile weapons with off-hand weapons or, more generally, to quickly change between various types of weapons. IWD2 solved this by enabling weapon sets. In BG, one can always swap weapons and/or shield sets for others via inventory, but it's tedious. I wrote a script that does this job as quickly as can be done upon a simple key press. Open the script with a text editor and follow the guidelines (preceded by ";"). I suggest you use Notepad++ and format the script using Language>A>AutoIt in the editor to have a better view. It's not a mod per se but I think it belongs in this section since it requires some customisation on your end. It's a rough job that can be improved if people actually need it. Great job Abel, I didn't know autohotkey, I'll take a look. Thanks for you comment! Since I feared not many people would take interest in this, I did, as I said, a very rough job. I've had ideas to simplify the user configuration and to add options to switch between various pieces of equipment (belt, necklace, boots, rings, etc.) but I'm yet to be convinced it would be worth working on. I guess you're pretty good with programming so you should find a way to tune my code to your needs! Salut Abel. Pas de problème, je l’adapterai à l'occaz pour BGT, mais pour l'heure c'est surtout autohotkey qui m'intéresse. Wil it put unusable items in your weapon slot? And I think we should build a list of resolutions and values fof the script. Or make more script together, I think its more lazy/noob user friendly. But Im sure to check it out. Does it work on bg 2? Then they would have had to change the whole interface. @Abel Thank you so much for the script. It will help me a lot, it is very annoying open the inventory every time. I am sure a lot of people don't know this. Bump! Be careful to suspend or exit the script when not playing. Oh, hello ! Glad it's of use! Thanks for the tip! Actually, since you're posting here, I'll tell you I was working on an in game script that would record and swap between sets. Way better than this AHK script since it wouldn't need external software. It's huge but alas unfinished. At one point I realised I couldn't spend the time it would need to make it work flawlessly. But the code's still on my hard drive, so maybe I'll work back on it sometime! If you're interested I'll share it, though it may not be worth the time needed to understand it. I can't believe I've missed this mod. Thank you! Could you please describe the whole process in detail, many thanks! @ioannisman What do you mean? Did you install Autohotkey? I think you have to customise the script and use the comments I included in it. Can you download the file? I don't see it anymore and I don't have it on my computer anymore. Autohotkey is installed , I open Autot3 Window Spy, the script is running in the backround, I start BG2EE but every time I press alt+s there are changes only in the weapons in the quick slots, any weapon in the inventory is unaffected. I add the script if that would be of any help, many thanks for your quick reply and a happy new year to us all! Ok, I'm checking the script. Did you find the coordinates with AutoIt3? It's tedious to do, but I don't know how the game scales with various resolutions. 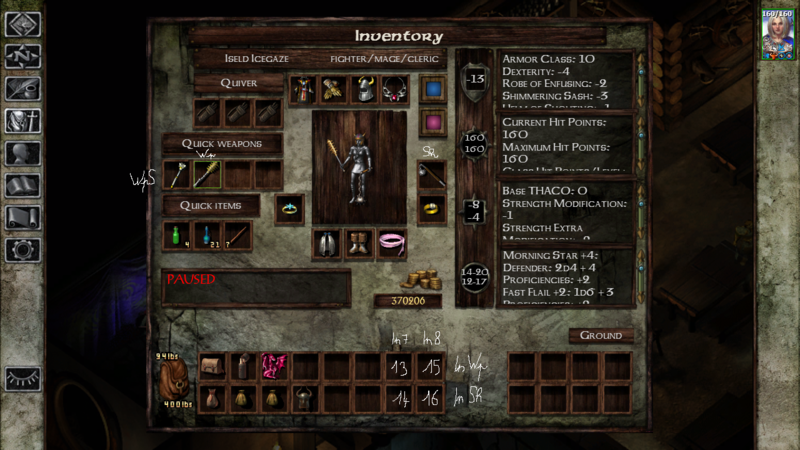 Now, Set 2 uses slots 15 and 16, which are the 2 slots of the last column in the inventory. Set 3 uses slots 13 and 14. So, you have to put your weapons in those slots for the swap to work. Well I play the game in a 22' monitor at 1680x1050 if that helps. I just cannot understand what to do, how I find the coordinates with Autolt3, this I think is the crucial point here! @Wilbur Thanks for your kind help! I included new lines in the script to help you get coordinates, so you don't have to use the Window Spy anymore. Just download the file of the first post again. Press Alt+p and a message box will give you the information. Ok, this is getting better and better but Abel and Wilbur even with your great support little progress is being done or something bad is happening with my cognitive abilities! the others I cannot understand how to find! So please my friends lets pretend that I am a 6 years old child could you please write down to each of the other 5 left a description for ex. second slot in top row from the right or first slot bottom row from the right? Many, many thanks for your time and interest in this! The coordinates for four weapon slots in your inventory are specified in In7, In8, InWp and InSh. It takes only four values since every slot shares a coordinate with another slot e.g. first weapon set's main and off hand slots share the same X coordinate (In 7 value) and the main hand slots of both weapon sets share the same Y coordinate (InWp) and so on. I can't provide you with a screen shot right now so hopefully this will clear things out. I made a picture to show you which coordinates you must get. I don't have BGEE installed so used IWDEE instead but should be the same. Remember: columns are X and rows Y coordinates. Is this script likely to work with Baldur's Gate 1&2 Complete? So far it hasn't been, but that could easily be user error. @EmptyPepsiCan Hello! Sorry I don't come around here often! About your question, I guess it would work. You just need the coordinates of the relevant slots! Thanks for creating a solution for this very important issue, I'm surprised it wasn't dealt within the EE itself! I followed the instructions for the configuration (I'm running with a 1920x1080 resolution, I think I got all the coords right) but apparently nothing happens when I click ALT+S in game with the software on. Here enclosed you can find the modified script, could you please check if you see anything wrong in it? Thanks in advance! Oh wao, I'm really late to answer @Alexbathory! Glad you found out the answer to your problem by yourself. I also take this chance to tell you that a true weapon swapper has been anounced for SoD. I've never been so glad that a script would become useless. Yay! Sorry to necrosurrect this but I was wondering if you still had your in-game script(BCS or BS i guess) in your hard drive that would fix the dual-wielding issue? @Earnest_ernest Hi! The scripts work for Autohotkey which uses .ahk extensions (BCS and BS are Infinity Engine games scripts). You can find these scripts in the previous posts. Beamdog updated its games and you can now switch between a WP/SH & 2H or WP/WP & 2H. You can't do WP/SH & WP/WP, though. If you need to, you can still use my scripts in tandem with the new feature. Im sorry, what did WP stand for?. The game doesn't let you swap between Weapon/shield and weapon/weapon because the game only lets you have 1 offhand item equipped at any time. I wonder if it would be possible to use some LUA UI tricks to allow actual item sets.